Of all people, Drew Mackie the Typo King probably has the least room to criticize others for stringing their words together in strange or unpleasant ways. But this fact has never stopped me before, I so I shall continue on. (Take that, conspicuously dark-colored kettle!) If you live in the United States and ride in wheeled vehicles, you have likely seen a certain safety slogan that bothers me — and probably me alone. My problem has to do with the two choices given: “Click It” and “Ticket.” The first could be a grammatically complete sentence, if it wanted to be, with the understood subject of you — as in “Hey, you! Dumbass!” — and then the imperative verb click and even the direct object it. The second is just the word ticket, sitting by itself all awkwardly, without a verb to complete the thought. It’s like an unbalanced equation, this offering of two grammatically unequal choices. Or it’s like twins, with “Click It” being the one that got all the good womb food and left “Ticket” malformed and sickly. In general, “Click It or Ticket” seems like it wants to mimic a more successful rhyming construction such as “Be There or Be Square,” which offers two grammatically equal choices, both of which are imperatives with the understood you. With “Click It or Ticket,” I can mentally supply the you for the first part, but I feel like it’s asking too much to insert the missing words in the second part until it makes sense. “[You] Click It or [Get a] Ticket”? “[You] Click It or [You Will Risk Receiving a] Ticket”? “[You] Click It or [an Officer Will Pull You Over and Issue You a] Ticket”? Nope. Asking too much, all of these. 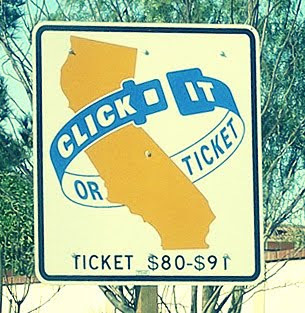 I will say, at least, that the American slogan reminding motorists about basic safety is better than its British equivalent, “Clunk Click Every Trip.” Because slant rhymes kill. I'm in Texas and I've always thought that some of these new or recent slogans just represent the coarsening of American society. Take the presently discussed, "Click It or Ticket". Some years ago the slogan was "Buckle Up For Safety", remember that? Emphasis on keeping you safe, not on fining you. Take "Don't Mess with Texas", I've always disliked that one. Compare that with "Keep America Beautiful" which I believe was coined by a Texan named Ladybird. These are the first two examples that come to mind comparing friendly slogans from the '60s and '70 to their more abrasive and coarse counterparts of more recent years. I live in California and have ran into the same issue with this campaign. I always get mildly annoyed whenever I see the signs. There is a another driving sign slogan that I've seen recently that is correct in terms of grammar but equally annoying. "SLOW FOR THE CONE ZONE!" I always read it in an overly dramatic and urgent way, as if voiced by the narrator for a TV wrestling match. This annoys me enough that I actually googled "click it or ticket grammar" and found your site. That phrase is pure hell. ...and no one else on earth seems to care except for approximately you, me, and the two other people who left comments here. Who doesn't put their seat belt on any more, anyway?